I often wonder what the future will be like when I retire, even more so now that I have children and hopefully some day have grandchildren too. Currently the retirement age in the UK is 68, I used to think this was old but now looking at my grandparents I don't think it's that late to retire at all. In fact I once worked with a fantastic hardworking lady until she passed away when she was 75! Anyway, I digress. I'll admit I don't have a pension and it's got me worried about the future and how I'd be able to live off the state pension which is currently £156 a week. 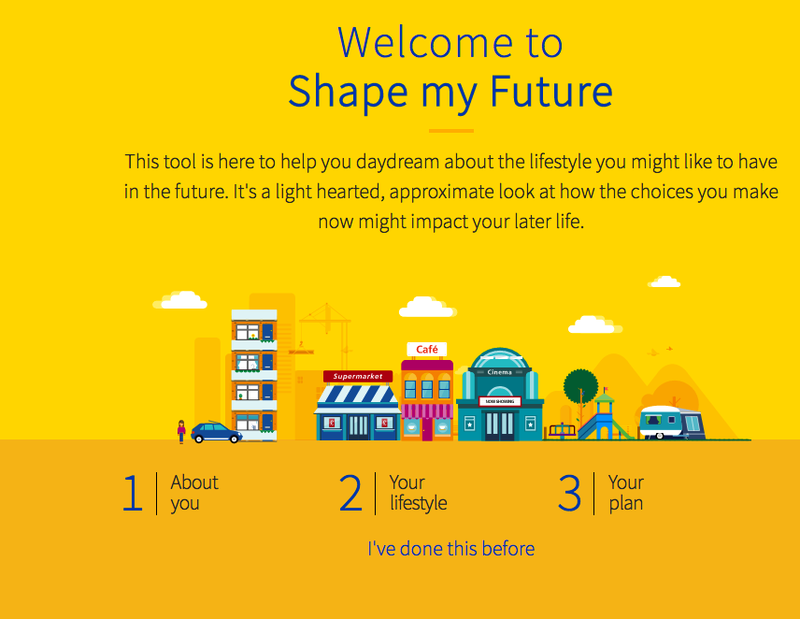 Aviva got in touch and asked me to try out their Shape my Future tool, which asked me to answer several simple questions to find out what my lifestyle might be like when I retire. The questions are basic about yourself and your budget and then you're given a lifestyle breakdown with your weekly balance based on your budget and lifestyle assumptions. As I previously mentioned I don't currently have a pension as none of my workplaces have offered one and I don't have my own one set up either, so I don't currently have any pension savings. However, I recently quit my payroll job and am now self-employed full time and have been thinking of setting one up and depositing a small amount each month. So I answered the questions as if I didn't have any pension savings but would be putting aside £30 a month which I am starting to do this month. 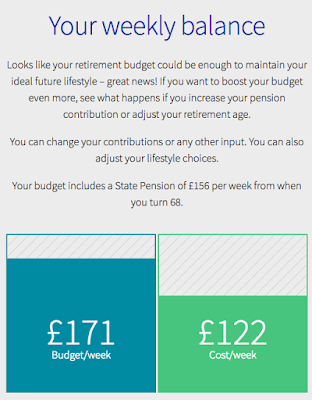 As you can see above, if I carried on doing this until I retire at the age of 68 I would have a budget of £171 a week which includes £156 State Pension. If I retired at the age of 70 instead of the UK average at 68 I would have a budget of £192 so it may be worth working for a couple more years especially as more people are living for longer these days. Aviva have challenged us to live off the weekly pension budget that I am given in the tool and share my experience afterwards of how we managed. I am looking forward to the challenge as I'm not that great at budgeting with my money so could do with a kick to get started and manage my finances better. When I first saw the result I thought it was pretty low, but considering by then I should have paid off any mortgages and obviously wouldn't have any childcare costs to take into account it sounded pretty reasonable. So this week I will be living off the state pension of £156 which will be used for food, petrol, school dinners, days out and will also go 1/4 towards any household bills. Come back next week to see how we got on! I was actually having this conversation with a friend two days ago as he is older than me and was talking about how he was seeing his financial advisor after our meet up about his many pension savings he has put away. I am like you and haven't put anything away yet and i am looking at doing this as it seems quite scary to think that if we didn't, we would only have the state pension each week which really isn't alot and would never allow you to have luxuries! Oh it's a horrible thought!! I don't think I want to know, we haven't had good jobs that gives us pensions or help towards them so I dread to think what ours would come out like!! I do have a pension but I think I reakky need to look at how much I am putting in it and what I might expect to get out of it in the future!